Screenshot detail: Gilets Jaunes demonstration, Champs Elysee, January 5, 2019. Wikicommons/Stefan Jaouen. Some rights reserved. But by concentrating for his answer on the character of the party leaders – an observer sport, entertaining as it is, that belongs to a bygone era – he has surely missed a far more important factor. In a way it is obvious. What the unprecedented defeat means is that in an era that has moved into many-to–many communication as its dominant characteristic, one-way persuasion no longer works. Yet from the beginning of the Brexit process, one-way persuasion is all that has been attempted. Let us remember the phrase ‘Brexit means Brexit’ with which we have been hammered and battered for two and a half years. It turns out, of course, that 70 days off from the self-imposed Brexit guillotine, we still have not a clue about what Brexit means. Even the hard Brexiters can’t agree among themselves about what it meant – and their insistences that they can look increasingly suspiciously like the opinions they happened to hold in the first place. So, this was not ultimately a persuasive phrase, was it? But it was a very insistent attempt indeed at one-way persuasion. Theresa May was going to do it (and maybe is still going to do it) ‘her way’. One-way persuasion under cover of negotiation with the EU meant leaving an awful lot of interlocutors out. It meant not talking to the parliamentarians at all, or letting them scrutinise the Withdrawal Bill as they ought to have done; it meant never talking to Northern Ireland, Scotland, Wales, Labour, 16-18 year olds, EU citizens in the UK, divided remainers (including working class, middle class and anti-EU remainers) and divided leavers (including middle class and working class leavers and Lexiters) – and reputedly not even talking persuasively to people in her own Cabinet including a succession of Brexit secretaries for two and a half years. Two and a half years is a very long time when so much is at stake. What is extraordinary is that we collectively sat around waiting for the outcome of this one-way-persuasion process, and didn’t have the gumption to get ourselves together, and work out what we wanted through mutual persuasion. We didn’t call for opportunities to do this. And we weren’t offered them – by anybody. Those who did stir contented themselves instead with slagging off whoever happened to be their polar opposite at the starting gate, in a manner that had been carefully prepared for us by the forces that openDemocracy’s investigative journalists have been investigating. This calculated production of just a sufficient range of enemy images to keep us pinned in servility is by far and a way the most serious disservice that the oligarchs and the mercenary propaganda firms have done to the UK, the EU and the future of democracy. Far more serious than the dark money involved or the rules broken. These breaches are just indicative of the larger depredation, the enemy images which have led pretty quickly to murder, incivility, and to our ongoing servility. Because they also seem to have persuaded us that we too knew who the enemy was, who the leavers were and who the remainers were, and how much they disagreed about the UK and the EU, without our ever getting together to meet each other and see whether we couldn’t change each others’ minds. Critics of the EU on both sides for example, have never exchanged views about the fundamental reforms needed there and how best to initiate them. The same goes for critics of the status quo in the UK, although as Yanis Varoufakis so cogently argues, the Brexit process has in itself exposed a whole raft of constitutional issues that fundamentally need addressing if we want to live in a democracy. They have done better in France, where Emmanuel Macron is also finding out in a rather more French way, that in the many-to-many communications era in which we now dwell, despite all those elegant speeches with classical references, governance by one-way persuasion simply doesn’t work. In France, the Gilets Jaunes have got out on the streets together. 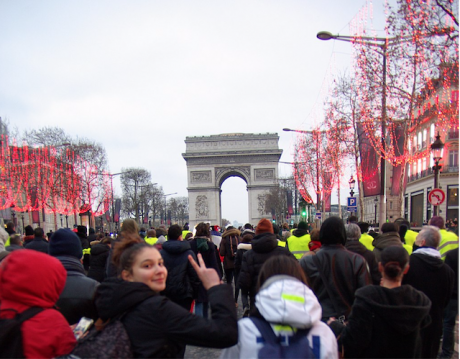 I have seen with my own eyes quite far left and quite far rightwing people walking arm in arm up the Champs Elysee, calling for a profound change in their mutual interest. Whether they can get to the next stage of talking through their differences… they agree, is a challenge. But they have been able to force Macron to offer the unimaginable – (of course to be sure with all sorts of hedging about and careful selection of topics designed to hijack the outcome for the status quo – what after all is power for if it is not to hold onto power!?)! But Macron has had to offer a debate between French citizens. It remains to be seen whether British governance can be persuaded to offer anything similar. Why is debate between so important? Firstly because it is the only way to be truly inclusive. Everyone can contribute to the debate – why not? This could be a substantial opportunity to give people previously not listened to a voice, something that our referendum result was calling for, almost as clearly as the Gilets Jaunes flocking to roundabouts to talk to each other and get their voices heard. Secondly, because when people get together, they can change each others’ minds, both about who all of them are and about what they want. It is the only way of arriving at a better consensus and in a world of many-to-many communication, this is the only kind of democracy which is ultimately going to work. The people of the UK, like the other peoples of Europe, all of whom have their own national versions of a rising nationalist far right, a democratic crisis, a wrecking austerity, and a scapegoating enemy image of migrants (joining bullying and gambling as another mainstream form of distraction), will only become ‘rulemakers’ when we have fought for and begun to win more of a democratic say in both. When we have begun to build a consensus on all those major issues that can no longer be ignored by power, and when we are vigilant enough not to let ourselves be manipulated, divided and conquered, over and over again. Unfortunately, I can’t see a way that the People’s Vote could avoid being yet another chapter in the latter, unless it is preceded by a more comprehensive opportunity for voice, an open, trust-restoring People’s Debate. Adam Ramsay’s suggestion of a ‘citizens’ assembly to craft the options that should be offered’ would certainly be a small step in the right direction, but would hardly in itself ensure ‘a chance for genuinely democratic dialogue’ that would not be rudely and prematurely shut down by the vote itself. This is because it is very hard to see what either side winning the vote would achieve, given a country with so many unpersuaded and, as many of the Gilets Jaunes seem to have realised, without a significant change in the power relations that govern us. The downside, in either eventuality, in terms of the additionally aggrieved, is only too clear. Parliamentarians should now ignore the inflexible British prime minister altogether, get together and build a consensus between themselves for the best holding operation that gives us time to set up an inclusive People’s Debate, throughout the nations of the UK. This holding operation could be on either side of the leaver/remainer divide, as long as there is a commitment to a comprehensive process of debate with the potential for radical renewal, and no chance of democracy being once again put back in its box. Unhooking us from infertile pre-occupations with leaving or remaining would release us from the pressures of the ticking clock. Instead, we could commit ourselves to a comprehensive exchange about the future for the UK that we really do want. For this is surely the other answer to the question, ‘What does the unprecedented Brexit defeat of the UK government mean?’ It also means that despite the government’s best efforts and unless it is brutally taken away from us, democracy is finally in danger of breaking out.